Well Roger and Paulos' shark fishing adventure went very well, you can see the photos here: Shark Blog. 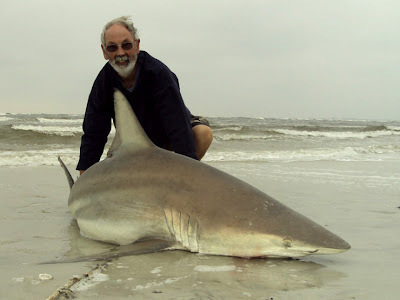 Loads of red drum, the odd monster stingray and best of all a six-foot-plus shark from the beach. We've talked about this photo for probably over a year now, often standing on the frozen banks of the River Wye while pike fishing. It's the trophy shot he's been after - top fishing guys! And before anyone else comments this... Jealous - hell yeah! Wish I'd had a 30lb+, there is always this year! But yeah I'm sure they could easily eat one. Now I'm a dubious about putting my fingers near a pikes mouth. This is a def no go! Unhooking sharks was surprisingly easy after Paulos showed me how to do it. And pike, I only tend to get bitten when I'm showing someone else how to safely unhook them - you tend to find yourself holding it while someone else is peering into it's mouth and you can't see what is going on. It was truly fantastic fishing with Roger again. The sharks have been sporadic to say the least this year, so getting to see him catch that big Blacktip was great. He also set the new benchmark for the Florida Reds. Was it 18 big red drum? That's a lot of action! I know it's not his PB shark but he really wanted one off the beach - bet that photo ends up on the wall! Hopefully the Lemons will show up in numbers, a late feeding frenzy - fingers crossed. Roger had 17 Big Reds, Blacktip Sharks at 72.25", 63", 47" and 30", two Jack Crevelles, a Flounder, numerous Bluefish and two Atlantic Sharpnosed Sharks. That's a fishing trip! Look forward to seeing the photos.